Director of Program Management on the .NET team at Microsoft. His team builds .NET Core, .NET Framework, ASP.NET, Entity Framework, managed languages (C#/F#/VB) and the Web and .NET Tooling for Visual Studio. Yes, you read the correctly, his team builds a lot of stuff. We told you we bring in the experts! Our attendees have been asking for these and we have delivered. This year, we are proud to offer you 4 choices. They are optional and cost extra. So you can buy a regular, 3-day ticket to TechBash, or you can opt for a 4-day ticket that includes the workshop + the conference. Again, we weren’t kidding when we said we bring in the experts. Check out the talks and the presenters and click the links for more details. TechBash is always a great deal. But, it’s even better when you get the early bird discount. Our best deal of the year expires on June 30th. Get your tickets now! It’s time to convince your boss! TechBash includes great sessions on current topics to help you get your job done! TechBash has great sessions that help you take your skills to the next level! TechBash offers great sessions that give you a glimpse at what’s new! Yeah, TechBash has non-technical content too. Soft skills matter! We bring in experts from around the country to teach you! with your peers, follow up with speakers, and meet our sponsors too! If you live in the region, travel is easy by car. That means no expensive plane tickets. No need to fly to Orlando or Las Vegas for a conference. We bring the content to you! Also, if you live in the region, you don’t need extra travel days out of the office! TechBash is not-for-profit event. We aren’t in this to make money and our price reflects that! Our goal is to make TechBash affordable. You don’t have to tell your boss that you’ll have fun too! 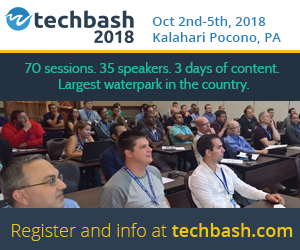 TechBash is hosted at the Kalahari Resort, home to the largest indoor water park in the country. 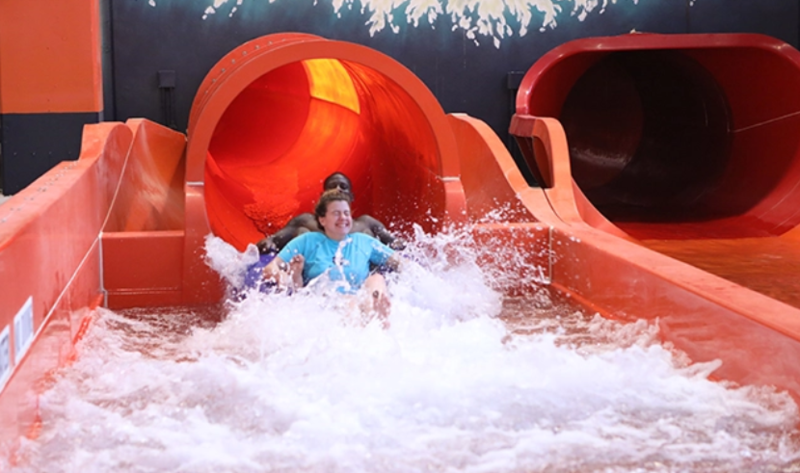 Our Kalahari hotel prices are great and include water park admission. I hope to see you in the Poconos this October! Posted in .Net, C#, Microsoft, TechBash, Technology. Did you know that early bird registration is now open for TechBash 2017? I can’t believe it is 2017 already, I never even got to write up a TechBash 2016 recap post! If you attended our last TechBash, you know it was great. So now is a good time to take advantage of the early bird pricing. All 2016 attendees received a special discount code that can be used before January 31. If you didn’t attend, you can register for $279 for TechBash 2017. Prices go up Jan 31. What should you expect from TechBash 2017? Great speakers, great content, great venue. We are currently working on getting a list of talks for 2017. But I can tell you now that most of the presenters have said they’d like to be back for 2017. Here are some of the comments we received from our evals. I think the quotes tell the story nicely. Having a conference of this caliber in NEPA [North Eastern PA] is awesome. The speakers were all friendly and accessible enabling deeper conversations regarding their presentations and related topics. It was a wonderful event and the content was perfect. Really, I thought everything was covered quite well. Nitty gritty implementation and syntax seminars? Check. Higher-level software planning seminars? Check. New and coming tools and libraries? Check. Inspirational keynote talks? Yep. Fun? Absolutely. I have all good things to say to our team upon returning, who will no doubt be a little jealous they didn’t attend this year. We will likely have a bigger group attending next year. Keep up the great work. This was my first major/multi-day conference and it was a great experience. Thank you to the organizers and speakers, I am definitely looking forward to attending again in the future. I was also inspired to one day hopefully speak in front of a group of developers. Great first conference, looking forward to next year! Speaking for the organizers, the conference went pretty smoothly, especially for a first time event. Mostly, the only problems that were obvious to any attendees were the occasional “presenter can’t connect to the projector” issues. And thanks the awesome tech staff at the Kalahari, these situations were quickly resolved. We heard a ton of feedback about how great the presenters were, people loved the venue and waterpark, and (this is real and I was quite surprised) people said we had the best lunch of any conference they attended! This event had a great community feel to it. Presenters, attendees, sponsors, and staff all learned from each other over 3 days. Lots of new friendships were made. Oh, and if you enjoyed the waterpark, you’ll be glad to hear that phase 2 will be completed this spring. That means a total of 200,000 sq. 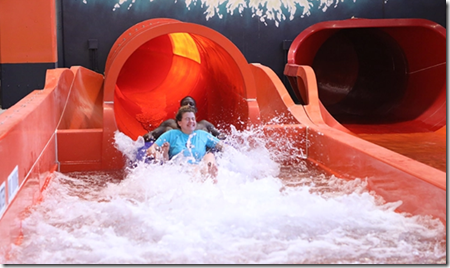 ft. of fun – doubling the size of the waterpark! Plus new restaurants, a ropes course and more! Please check out TechBash 2017 for more information and to register. If you are not already on our mailing list, please sign up to get all the latest info.